It was a sad, sunless Sunday at the corner of 4th Street and Hearst. 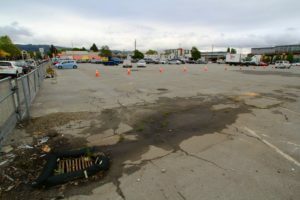 Few shoppers—or Berkeley residents for that matter—are aware that an ancient Ohlone village once graced this sprawling site around Spenger’s restaurant. It’s a boundaryless area that is worthy of being listed on the National Register of Historic Places: the earliest and biggest of the Bay Area shellmounds, a site dating back to 3,000 BC, where oysters, clams, abalone and yes, human burials, grew 18 feet high. 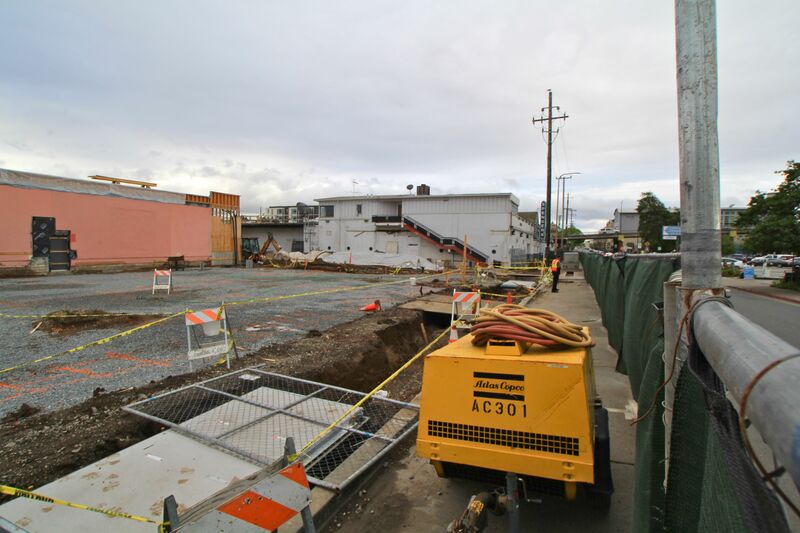 It actually is an official Berkeley Historic Landmark, and so workers should not have been digging four-foot deep trenches just north of Spenger’s last week. But they were—and they unearthed human bones surrounded by shell midden. Work stopped immediately. Ohlone descendents and allies gathered on Sunday afternoon to share prayers and songs to honor the ancestor and seek a sane future for this bizarre, bustling corner of consumer capitalism. As sweetgrass, sage and tobacco smoke rose toward the gray sky, ambulances, bicycles and Amtrak trains whizzed loudly by. One angry shopper yelled at the 50 people who spilled into the busy intersection, but heart-felt prayers continued for an hour. 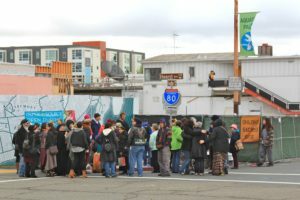 Corrina Gould, an Ohlone leader who defends and teaches about the shellmounds, said, “This is a day for prayer, not for protest.” With the sprawling Spenger’s parking lot just across 4th Street slated for a 5-story apartment building with 15,000 square feet of retail space, Gould said, “This ancestor made itself known at this time for a reason. We pray today to help us figure out what to do next.” As in: how do we restore dignity to an ancestor who was laid to rest 5,000 years ago? 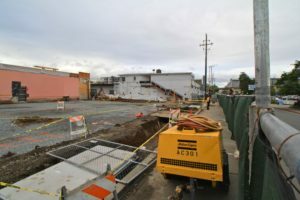 For more information, check out this very thorough report on the March 14 Berkeley Zoning Board meeting, by Emile Raguso in Berkeleyside: “Critics question impacts of ‘Spenger’s parking lot’ project on Berkeley Fourth Street, Ohlone heritage.” The meeting was essentially a scoping hearing for an Environmental Impact Report that should be completed by January 2017. And after the human remains were disturbed there was a follow-up: “Ohlone human remains found in trench in West Berkeley.” Corrina Gould’s website, Indian People Organizing for Change, has the deep history. The city of Berkeley should buy the parking lot and make it available as a public park, a green space that recognizes and honors Native California history. A giant building covering the entire 2-acre lot with no open space is crazy. I suggest a memorial park on this very visible site that can be seen from freeway and train, and on the western edge let’s build A WALL! and paint a mural of the open Golden Gate, the original Bay shoreline, the massive shellmound. Let’s bring Strawberry Creek back up to the surface so that it can flow ri ght through the wall. 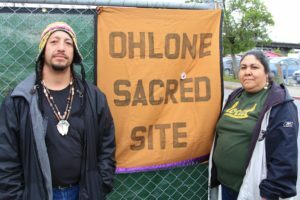 We should all support our Ohlone friends and make this a reality—a protected sacred site in Berkeley’s heart. For a May 2016 update, after a second Ohlone human remain was disturbed, check out this piece in the East Bay Times. Pictured above: thanks to Wicahpiluta Candelaria (Rumsen Ohlone) and Corrina Gould (Chochenyo Ohlone). May your sadness bear fruit. Prayer ceremony for disturbed Ohlone ancestor. Behind the fence, deep trenches, human remains. This could be a green memorial park.